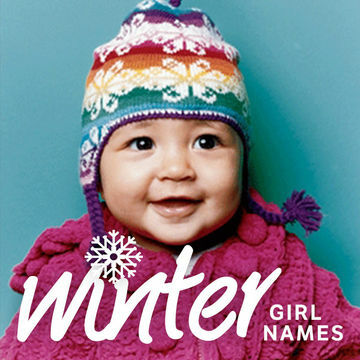 Consider these wintery choices as pretty baby girl names. Congratulations—you're expecting! Finding the perfect baby name is just one of the hundreds of must-do things of your list before your little one arrives. If your baby is due this winter, get inspired by the season to find the ideal baby name. Start off with the most obvious choice—Winter itself. Winter is a very pretty baby girl name and can be spelled Wynter, if you want something a little different. The winter weather might also provide some baby name inspiration. The Christmas season is behind us, but that doesn't mean you should forget about the holiday names. Check out these Middle name trends for girls. Also look ahead to February and consider Valentine as a name for your baby girl. The winter months—December, January and February—can also make terrific baby names. Winter plants and flowers might also make your baby name list! Amaryllis, Orchid and Primrose. Even Branch and Ivy can get be wonderful options if you are looking for a name inspired by nature. More baby names inspired by nature. The blanket of white snow outside your window might prompt you to name your baby a name that means "white." Blanca and Ivory might be obvious choices, but many other baby names that mean white or fair should be on your list. More names via Baby Hold. Celebrity babies born in the winter and The best (and worst) celebrity baby names.